Male voices and perspectives dominate the crime noir genre, but Oni Press’ Angel City is changing that both on and off the page. Written by Janet Harvey with art by Megan Levens, this six-issue miniseries follows Dolores Dare, a young woman who moves to Hollywood in the 1930s to pursue a showbiz career, but instead ends up attached to a local gangster as both his girlfriend and one of his enforcers. Dolores is bold, sly, and resilient, and she’s put these talents to good use as she investigates the murder of her childhood friend, who took the trip to Hollywood with Dolores and ultimately suffered a tragically premature end. Harvey’s script is firmly rooted in Hollywood history, and she uses the setting to add a heightened sense of drama and glamour to the story, which is constantly revealing new facets of Dolores’ personality and her relationship with the late Frances. Dolores isn’t the typical crime noir lead, and her specific experience as a woman in ’30s Hollywood opens up narrative avenues that have made Angel City a surprising, compelling read. This preview of next week’s Angel City #4 brings a major change to Dolores’ situation as she cuts ties with her gangster boyfriend, and now that she’s left Gino behind, she can fully commit herself to finding Frances’ killer. 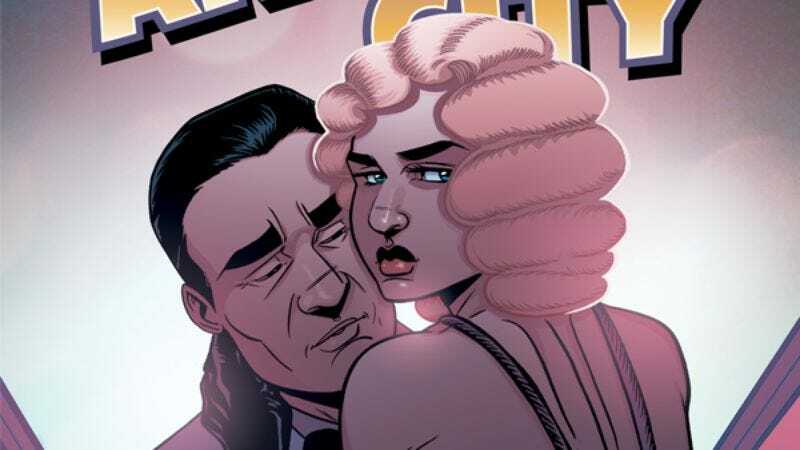 Megan Levens’ clean, slightly cartoonish artwork is another thing that sets Angel City apart from other crime noir comics, but it works well with Harvey’s script, bringing a strong sense of vitality to the characters and their environment. She has a deep appreciation and understanding of the design elements of ’30s Hollywood, and her attention to detail in the costumes and settings make this world come to life. Nick Filardi’s coloring plays an integral part in reinforcing the vibrant atmosphere, but this preview shows how it also enriches the darker elements, opening with an intense contrast for the mob violence before settling into a more subdued gray palette that reflects how the passion has drained from Gino and Dolores’ relationship. Readers can venture deeper into Angel City next Wednesday, and the first three issues are available in comic shops and on Comixology for anyone that wants to catch up with this unconventional crime noir.